Tonight, I wanted to give you the full tour. The collection sits at 114 as this post is published. I have one signing happening in March that I have already committed to, and I have two more that I am also very likely to get involved with. So, the collection will grow – for sure. And the quality remains at an all-time high as well. While I could easily have between 120-130 signed balls in my collection thus far, the last 18+ months have been more about quality and less about quantity. And the results of that philosophy has netted me some pretty elite players – and for me, that is extremely exciting. That was a lot of typing. But, in time, I think I will be able to type some more as I am really looking to build my collection in the early parts of this year. As I mentioned earlier, I am committed to one signing already, have my eyes on two more, am still hunting a Tom Seaver ball, and I am always looking for more Andre Dawson opportunities as well. I’ll tell you what my wife thinks – She thinks I am NUTS!!!! Thanks for reading. Have a great night! With the new 2013 Topps Archives baseball card set release, the ‘Mini Tallboys’ subset is easily one of the best parts of the issue. The cards from this subset offer a very basic, but throwback feel that screams vintage. The set is 40 cards deep and offers a nice mixture of current players, stars from the 1980′s, and Hall of Fame legends. Williams was a solid player for the better part of his career. A stud third baseman, with superior offensive skills, Williams was well-round and well-liked. In addition to his 5 All-star team selections, Williams also won 4 Silver Slugger trophies and 4 Gold Gloves. His career stats include 1,878 hits with 338 doubles and 378 home runs. Williams scored 997 runs while driving in another 1,218. Williams played in 3 World Series match-ups during his career. 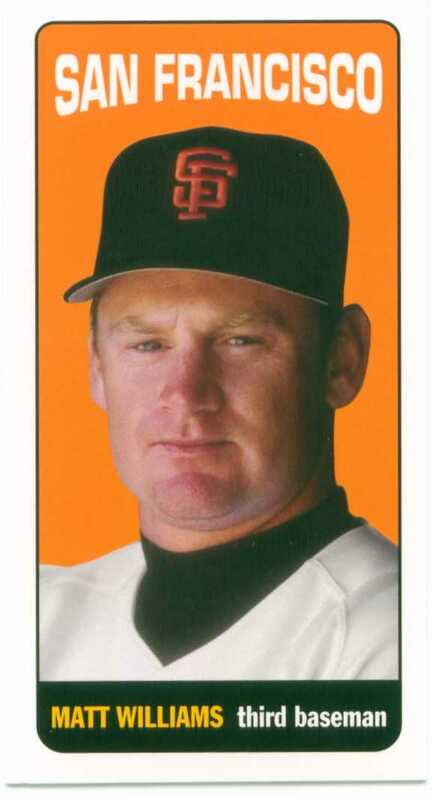 He finally won a title in 2001 as a member of the Arizona Diamondbacks. This post has been 4 1/2 years in the making. 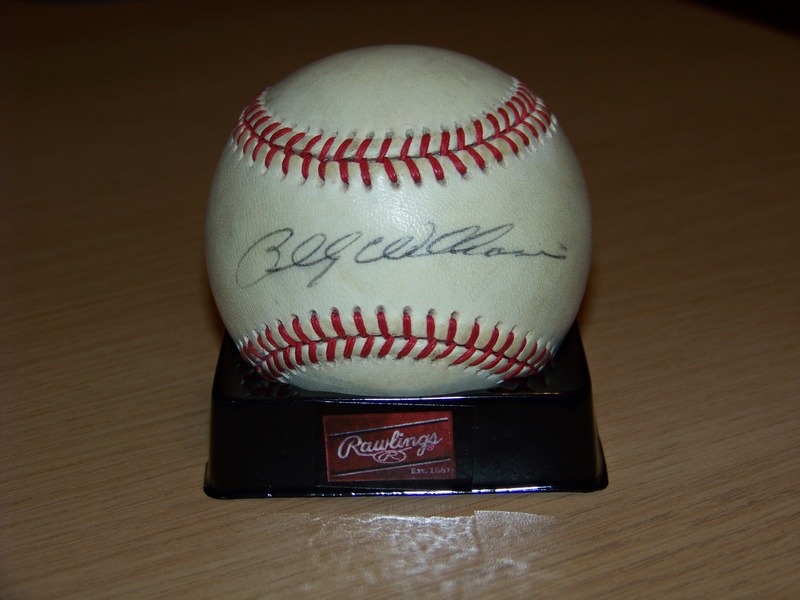 When I started ’30-Year Old Cardboard’ in the summer of 2008, I had one signed baseball in my collection – a Billy Williams ball that I got signed in the in 1989 while living in Chicago and attending a Cubs Convention with my dad. Mr. Williams was so friendly towards me; both my dad and I became instant fans!! I lugged that ball from state to state and from house to house for more than twenty years. And once I decided to get back into the hobby of baseball card collecting, I dusted off my Billy Williams ball, bought a new UV-protected case for it, and kept it on my desk for inspiration. 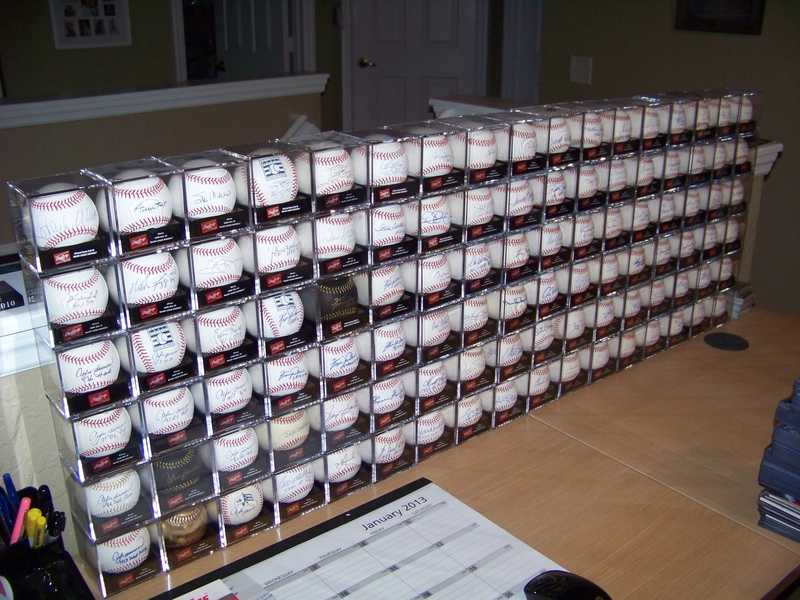 Fast forward to today and I am happy to be celebrating that I now have 100 autographed baseballs in my collection. The collection, just like my cards, is focused around men that helped shape the history of the game in prior decades as well as the players that impacted my love for the sport during my youth. I’ve got Marlins. I’ve got All-Stars. I’ve got Cy Young Award winners and MVPs. I’ve got World Series heroes and I have Hall of Famers. I have signed balls in my collection that I never really thought that I would obtain. And, of course, I have some balls in my collection that I wish I never did obtain. But, I tell you what – I love this collection. And for as much as my Hank Aaron and Reggie Jackson and Willie Mays signed balls mean to me, the single best ball in my collection is still that old National League ball signed by Hall Of Famer, Billy Williams. 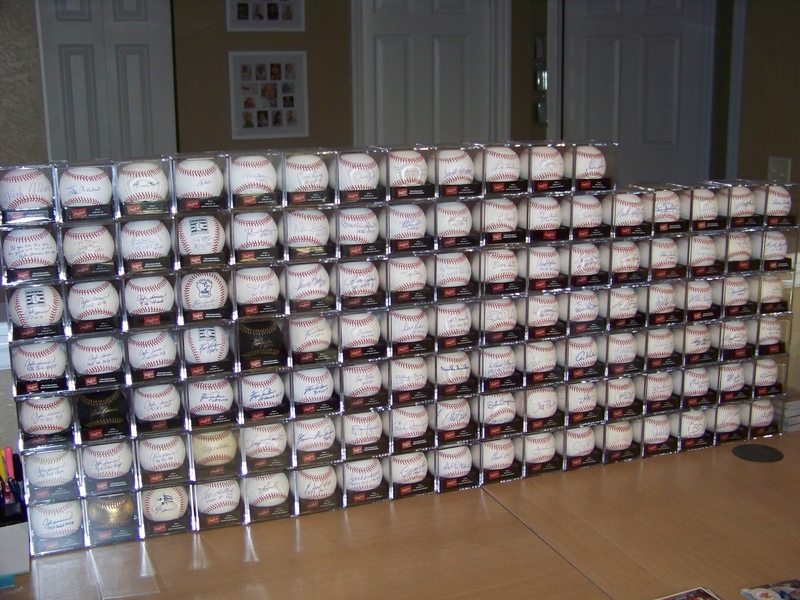 I already have plans in place to add more baseballs to my collection. And while I don’t have a target number of balls that I want for this extension of my baseball card collecting hobby, I am pretty confident that the collection will continue to blossom in the coming years! I Have A New Gem In My ‘Ultimate Dawson’ Collection. You’ve Got To See This!!! You may recall tha tback in January I showed off a Pete Rose signed photo that I had picked up for what I thought was a huge bargain. If you don’t remember, or would just like ot re-visit that story, you can do so here. As excited as I was to obtain the signed photo of ‘The Hit King’, I knew that my mission was only half complete. So, a few weeks later, I sent a ‘Mystery Package To Andre Dawson’. Well, now, less than three weeks later, I am very excited to annouce that my ‘Mystery Package’ has been returned to me. And now I have a new ‘GEM’ in my ‘Ultimate Dawson’ Collection. Signed perfectly in Blue Sharpie by Andre Dawson, this is my first ever dual-signed photo. And I could not be more happy with how it turned out. As usual, Dawson applied a perfect signature to the photo, and he placed it exactly where I asked him to. 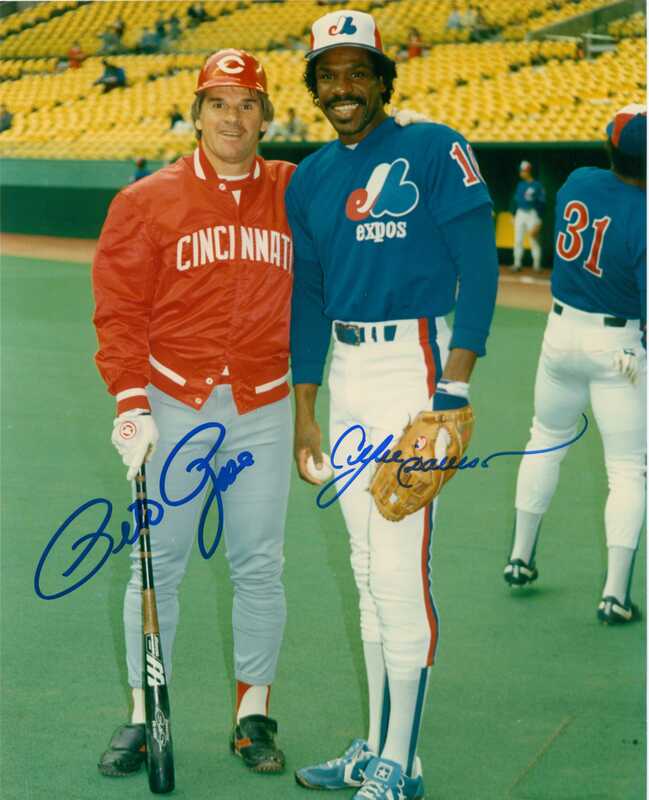 Having Pete Rose’s signature on this image was spectacular. Now having this image signed by both superstars is for me, unreal!!!! The Newest Autograph To My Collection: Signed Pete Rose 8×10 Photo!!! I am a big fan of Pete Rose. And in time, he is a player that I would eventually like to build a nice collection of. The single greatest moment of watching baseball on television from my youth is watching Pete break Ty Cobb’s all-time hits record. And that says a lot as I was also glued to the TV for Boston’s collapse in the 1986 World Series, Kirk Gibson’s dramatic 1988 World Series home run, and other hugely dramatic and important baseball moments in the 1980’s and 1990’s. But, it was Pete that took the cake for me. And to this day, I fondly remember watching that moment in September of 1985. I’ve always wanted a nice, large picture from that game in my collection. And of course, I would want it signed too. But, they are expensive. And there are plenty of them available so I am in no rush to add one to my collection. Instead, I have focused on another image of Rose that I like, possibly even better. I have seen it multiple times, and each time it gets my senses tingling. I’ve never acted on it because of the cost it would take to get Pete to sign it for me would more than likely be higher than what I would want to pay. And then I found a signed version of it. And it was right in my price range!!! Are you kidding me? Pete Rose and Andre Dawson?!?!?! I scooped this signed 8×10 from an extremely reputable seller on Ebay. The certificate accompanying the photo gives me a lot of confidence that the autograph is 100% real. I did a lot of investigative work before purchasing this one – and now that it is home, I am thrilled with how it came out!!! And you have to know what’s next… I need to get it signed by Andre Dawson. And once completed, it will be a centerpiece of my collection – FOR SURE!!! I have a few things going on with my collection right now that prevents me from sending this out immediately, but I can be a patient man when I have to be. Once some of the pending projects I am working on are complete, I will definitely be sending this one off for autograph #2!!! And I will let you know when that happens… Stay tuned. And thanks for reading! 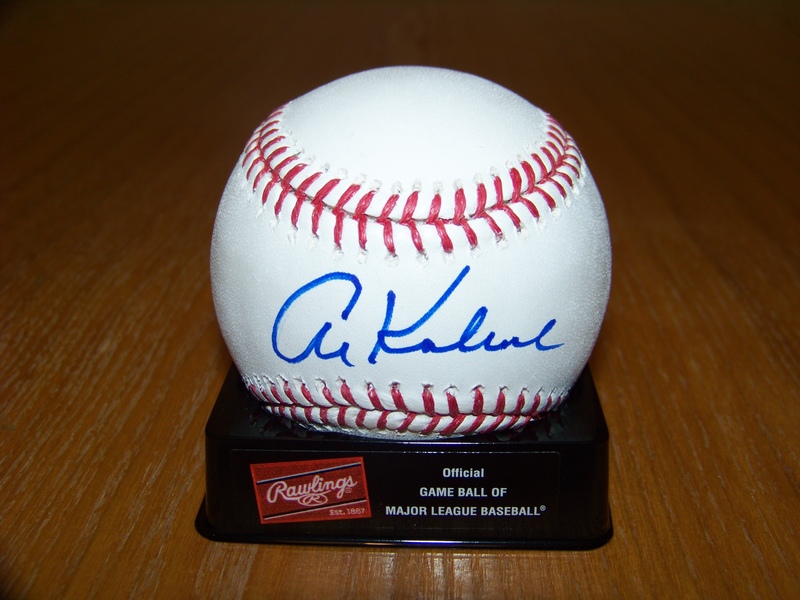 Finally, Al Kaline Returns A Signed Baseball For ’30-YOC’!!!! I have 4-5 baseballs out in the mailstream, so I had no clue who the return was from. And the USPS did not stamp the outside with the mailing zip code prior to sending it back to me. But, once opened, I was relieved!!! Al Kaline finally hooked me up. And this was ‘Strike Three’. First, I sent to the Tigers in Lakeland during Spring Training – Strike One! Then, I sent to Kaline’s home in Michigan – Strike Two! Finally, Kaline signed for me courtesy of the Detroit Tigers. And the autograph looks great. It may have cost me more postage than I normally would spend for a TTM baseball, but overall I am very happy to finally have a signed ball back in my collection. It has been a very long time since I have shown you my balls. And I should not have let it go this long. My balls are very, very special to me and I pay a lot of attention to them. I have been writing this blog for nearly four years. When I started, I had just one ball. Today, I have 85. Yes, 85 balls!!! I wish that the picture was able to be zoomed in some more so you could see everything clearly, but I also wanted to show off the whole collection in one picture. And while I do not normally keep them stacked in this fashion, I wanted you to see the magnitude of my collection all at one time. 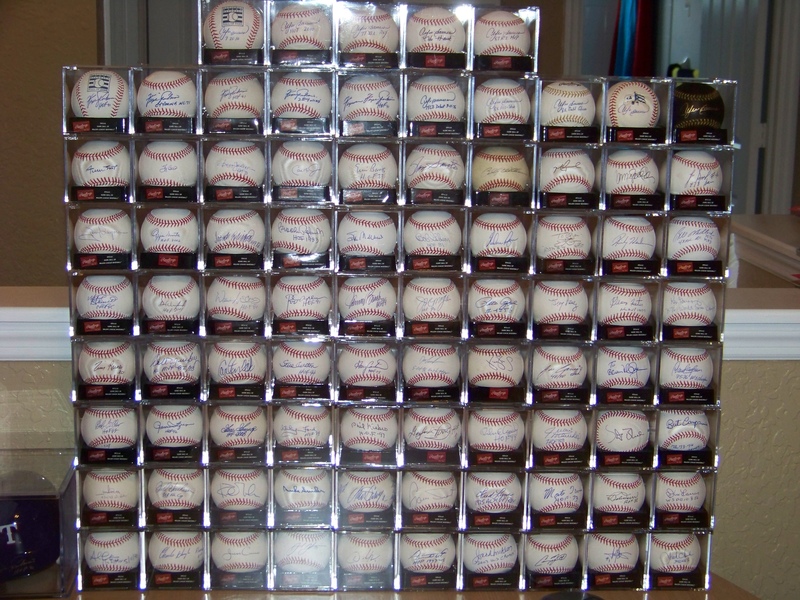 Typically, my collection of balls are displayed in three groups – Andre Dawson, Fergie Jenkins, and other. The Dawson count is at 10; the Jenkins count is 5; and the other count is at 70. I have plans to add more. And while 100 is possible by the end of the year, it is not a goal at this point. I am still seeking quality over quantity so if I add just 4-5 more this year, I would happily accept quality.